Pas de la Casa/Grau Roig are purpose built resorts at the southern end of the ski area and sits right on the French/Andorran border. It is the highest ski resort in the Pyrenees at 2100 metres. Pas de la Casa is a lively alpine resort with plenty of après ski. Pas de la Casa established itself as a ski resort when the first drag lift was built in 1957. Since then it has expanded its lift system regularly and now has eight quad chairs and three six seater chairlifts. The resort also has an FIS approved slalom stadium and has snow quality and quantity virtually guaranteed from mid November to mid May, all backed up with state of art snow making machines. There are a number of Restaurants in the village serving excellent traditional Catalan food. Visitors will find the bars relaxed, friendly and informal with the drinks very reasonably priced. Soldeu is a modern dynamic resort set in picturesque scenery whilst El Tarter, situated just a few km away from Soldeu, is a more traditional resort. 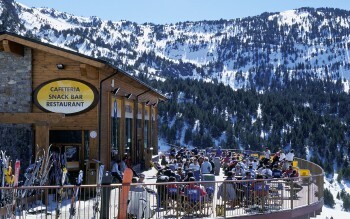 Soldeu /El Tarter are one of the more dynamic sectors of the Grandvalira's ski area, with a superb, lively atmosphere. The snow park provides a practice area for those wishing to defy gravity, whilst Mickey's Snow club will look after and entertain the children allowing parents to explore the ski area. From Soldeu, a Gondola takes skiers up to Espiolets slopes. From El Tarter you have a choice of two ski lifts accessing the Pla de Riba Escerxada slopes. From here there are a number of lifts that whisk both intermediates and advanced skiers quickly up into the Grandvalira. Canillo is an excellent resort for beginners, for families and for those guests who look for the comfort of a tranquil town without crowds. Situated on the main Grandvalira's mountain pass, the village lies just below the El Forn valley and the skiing here rises from 1500 metres to 2640 metres. The Ski area is accessed easily and quickly via a modern eight seater gondola lift. The gondola runs from the centre of the town and within minutes drops skiers at an altitude of 2000metres in the heart of the El Forn valley. Encamp is a traditional Andorran town, with plenty of activities for skiers and non skiers alike. There are some high quality restaurants and bars with regional food in the town all at a very reasonable price. Other facilities in the village include two museums - the National Automobile museum and the Museum of Sacred Art, and a large sports complex with gym, swimming pool and Sauna. Visits to the Romanesque church and the stunning scenery at the Engolasters lake are also must do's whilst on holiday in Encamp. The Funicamp gondola takes you up into the heart of the Grandvalira's ski area, where the skiing possibilities are broad for all levels. Encamp also caters well for boarders with a board park and a half pipe. The ski area is the largest in the Pyrenees with over 200kms of marked piste and 66 lifts connecting six resorts ranging from Encamp at 1300m to Pas de la Casa at 2100m. The ski area extends from 1700m up to 2640m and now rivals many of the traditional great Alpine resorts in terms of quality of skiing, ski lifts and ski schools. Encamp is the prettiest unspoilt resort. The funival bubble lift which carries 16 persons at a time rises swiftly up from the centre of Encamp to Cortals at 2502m high above the main Soldeu / El Tarter ski area. The bubble lift from Canillo rises 500m up to El Forn - a beautiful valley. A chairlift and drag tow serve an excellent nursery area - perfect for beginners and children. The Portella chairlift rises up to the summit of Portella at 2465m; from here there are a choice of runs back down to El Forn - Rossinyol - a delightful blue, Gaig an interesting black to the left of the chair as you ski down; alternatively there are a couple of freeride pistes that are marked but not patrolled or groomed which dive off the Rossinyol blue. From the summit the Daina blue run forms the link to the rest of the ski area. There is a north facing bowl designated as 'off piste' or 'free-ride' down to Riba Escorxada at 2100. Alternatively pick up the Llosada chairlift to Tosa de la Llousada at 2560m for a choice of runs. From El Tarter at 1710m two lifts - a bubble lift and a high speed chair lift rise to Riba Escorxada at 2100. Here there are nursery areas, cafes, ski school, crèches. The 6 man chair up to Tosa de la Llousada opens up a number of runs back down to Riba Escorxada. Llop is a steepish red which swings underneath the chair lift before joining the gentler Guineu blue run. There are two options to ski back to El Tarter - the picturesque Esquiel blue which follows the summer mountain road, or the north facing Aliga black which drops straight down the fallline. Back up to Riba Escorxada the 6 man Espiolets chairlift opens up a number of north facing blacks; or take the quad Migdia chair and then the blue run - Gali de Bosc - half way down this run splits you can either bare left down to El Tarter or right down to Soldeu. From Soldeu at 1800 m the 8 man bubble lift or 6 man express chairlift rises up to Espiolets at 2250m. A gentle ski through the nursery slopes opens then on to the Escola chairlift. From the top of the ridge this south facing bowl has some delightful reds and blue runs to keep everyone happy. The 6 man Solana chairlift then the 4 man Assaladors chair lift takes you back to the top of Tosa de la Llosada - either head back towards Portella and Canillo, or head back down the Obaga blue run to the 4 man Solamelles chairlift which goes up to the Col de les Solamelles at 2458m. From here there are some wide open meadow runs from 2150 up to Cortals at 2502m. From Cortals the Funival bubble lift descents over 1200m back to Encamp. But if you take the Colibril red or the Enlac blue over to the 4 man Llac del Cubil chair lift you access the glorious Grau Roig bowl. Grau Roig is a fabulous bowl to play in - good amenities, great cafes, and a selection of blues, reds and blacks on north, east and south facing slopes. On the north facing side the Antenes, Riberal and Pic Blanc chairlifts not only access Pase de la Casa but also open up some steep reds and blacks. At either end of the north facing bowl are two lovely blue runs back down to Grau Roig. The Pic Blanc drag tow goes up to the highest point at 2650m. From here a delightful blue run - Portella swings round a quite almost hidden valley to then pop out back in to the Grau Roig bowl. But baring right from the top of the Pic Blanc drag tow opens up another freeride area. Back down at the bottom of Grau Roig, the Monnalus Chair is a must - one side a sunny red the other side a cold steep north facing black. The Cubii chairlift heads back towards Soldeu, but also opens up some lovely high mountain pasture skiing with a choice of 2 reds, a blue and 2 blacks back down to Grau Roig. Pas de la Casa is accessed by nipping over the Col Blanc - 400 vertical metres below with a choice of blue, blacks and reds lies Pase de la Casa. A new chairlift up the left side of the valley opens up the Abelletes nursery area and also the stunning Coll des Isards chairlift which gives beginners a true understanding of what it is like to explore the mountain on skis and boards. The runs off the 6 man chair Font Negre are 'interesting' the red being a lovely carving run down while the black is surprisingly 'black'! The rest of the ski area is accessed by taking either the Font Negre , Pas de la Casa or the Costa Rodona Chairlifts up to the ridge and heading north. The Grandvalira ski area is dotted with bars, mountain restaurants, freeride areas, parks for those who want air underneath their skis and boards, timed slalom runs, snow mobiling, snow buggies, crèches and ski schools.